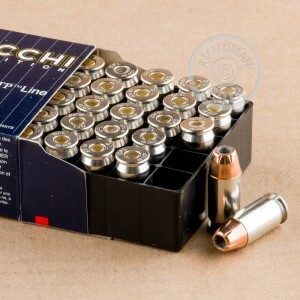 This .45 ACP ammunition combines the reliability and cost-effectiveness of Fiocchi cartridges with the strong penetration of Hornady XTP hollow point bullets. 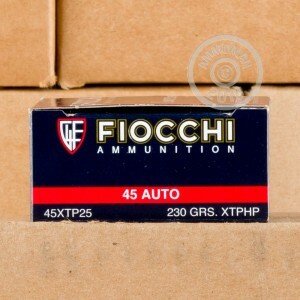 Manufactured at Fiocchi of America in Missouri, these rounds come in boxes of 25 and fire a heavy 230 grain version of the XTP. A great self-defense or carry load for 1911s or other .45 pistols. The superior penetration of the Hornady XTP is particularly welcome in .45 Auto as it gives the relatively slow-moving bullet a better ability to pass through barriers and heavy clothing to stop an assailant quickly and decisively. Browse AmmoMan.com's great selection of reasonably priced ammo and place an order today for $99 or more to qualify for free shipping! The XTP Bullet has always been a very accurate round in 1911 Pistols. I ordered some of this and was impressed with the quality! Good, clean ammo! Accurate as expected! The price is right too! The People at Ammoman always get it to Me FAST! When they say "It is shipped" It IS Shipped! I mean it is in the carriers possession and on it's way to you! I like that! A Lot! Refreshing! Too many sites say it is shipped, but reality is they have only made a label! Not Ammoman, they tell the Truth! Shipped means Shipped!